I mentioned in my last post that Terry took me to a local wholesale nursery last week. We needed to pick up shrubs and perennials for customers, as well as annuals to keep on hand for container gardens.With Buster the dump trailer attached to the pickup truck, Terry and I rolled out of Irvington at 7:00 to make it to Brehob's at the 7:30 opening. Turns out, there is an entire hidden valley in Indianapolis I knew nothing about, and it is filled with plants–rows upon rows of hoop houses filled unto bursting with trees, shrubs, perennials, and annuals for sale, to say nothing of the miles of extra plants being fattened up for sale. And because we're "in the trade," we can buy our own plants at wholesale when we buy for customers. It's a good thing we only go very occasionally. Taking me to the wholesale nursery is like holding a Weight Watchers meeting in a chocolate factory. Frankly, my willpower is just not that good. Naturally, Brehob's doesn't want a bunch of plant fanatics like me roaming the place and messing with their system. After checking in at the office, we drove to the nursery section (trees and shrubs) where we were met by a nice guy driving a miniature John Deere truck ("Gator," Terrry informed me–the truck, not the guy). We handed him our list and followed him around to hand pick our shrubs. 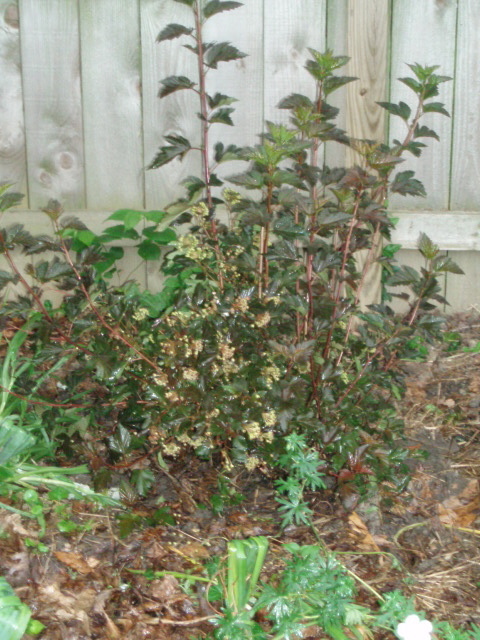 I knew from the web site that they were out of the deutzia I wanted, but I did score an excellent ninebark–'Summer Wine.' By the time we left the nursery section, the truck bed was loaded with bayberries, grasses, dogwoods, and my pretty little ninebark. We headed to the perennial hut, where I spent most of my time loading everything Terry picked out into Buster the dump trailer. Unfortunately for Terry, they were out of black and blue salvia, which means that Amy F will continue to poke at him for bogarting all the available salvia on the last Brehob's trip, leaving her without any. 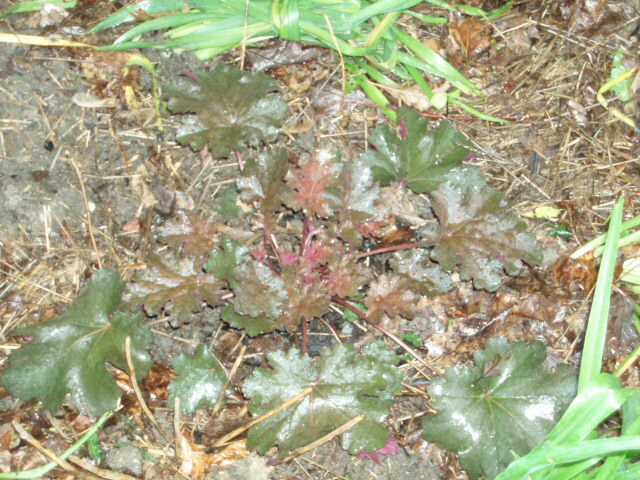 I lusted after a plum-colored geranium, but decided the scorching on the edges of the leaves was a bad sign. I went with a plum-colored huchera instead ('Chocolate Ruffles'). With time growing short and the sky starting to look ominous, we hit the annual hit. I bought about four flats of annuals, plus some enormous coleus. I couldn't find prices for a lot of things, so I did some guessing. By the time we headed out at about 9:30, we had a trailer and truck bed loaded with plants covered with tarps, and I was in the hole to Terry for about $100. Still, for the number of plants I bought, that's a pretty good deal.My ninebark and huchera have settled into the shade border, and the coleus is planted in a recycled metal container to fill out a bare spot there. 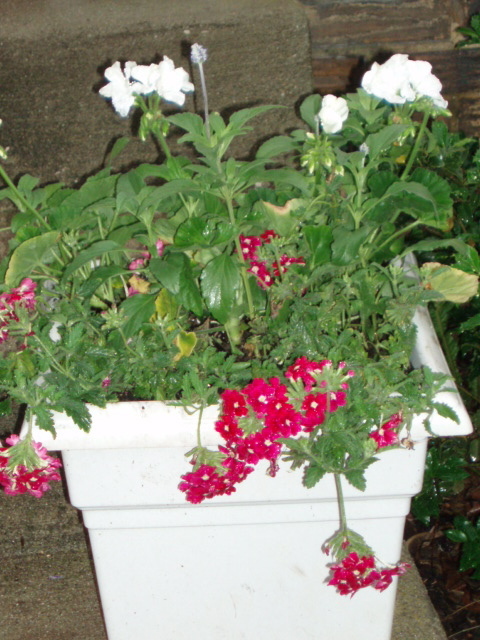 The window boxes and porch containers are overflowing with white geraniums, purple salvia, and hot pink verbena. And a flat of lisianthus awaits planting in the rose bed. The potting bench has been painted and awaits only my BF arriving to help me move it into place. The garden bench needs one more coat of paint, then it too can take its place in the garden. There's still a lot to do, but I may make my party deadline after all!